Democrats launched a sweeping plan Thursday to transform the U.S. economy to combat climate change and create thousands of jobs in renewable energy, signaling its likely elevation as a central campaign issue in 2020 despite President Donald Trump's failure to mention climate change in his State of the Union address. 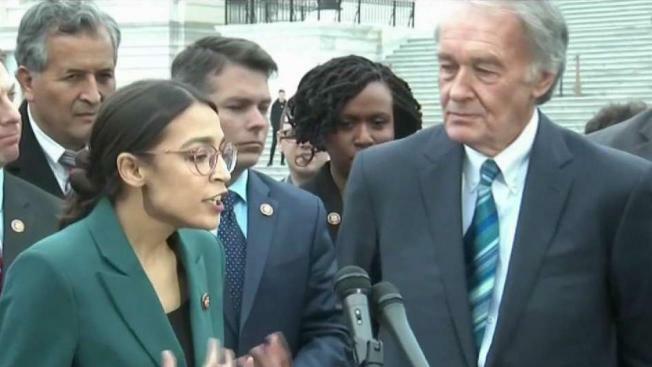 At least six senators running for president or considering White House bids backed the Green New Deal put forth by freshman Rep. Alexandria Ocasio-Cortez of New York and veteran Sen. Ed Markey of Massachusetts. The nonbinding resolution calls for a "10-year national mobilization" on the scale of the original New Deal to shift the economy away from fossil fuels such as oil and coal and replace them with renewable energy sources such as wind and solar power. It sets a goal to meet "100 percent of the power demand in the United States through clean, renewable and zero-emission energy sources," including nuclear power. "Our energy future will not be found in the dark of a mine but in the light of the sun," Markey said at a Capitol news conference. The plan goes far beyond energy to urge national health care coverage and job guarantees, as well as high-quality education and affordable housing. The resolution urges elimination of fossil fuels pollution and greenhouse gas emissions "as much as technologically feasible" in a range of economic sectors and calls for "upgrading all existing buildings in the United States" to be energy-efficient. Data from NASA and NOAA show a continuing pattern of the global temperatures rising since 1880. The three hottest years on record were 2015, 2016 and 2017, followed by 2018. "This is now a voting issue across the country," Markey said. "The green generation has risen up and they are saying they want this issue solved" as one of the top two or three issues in the 2020 election. A coalition of labor, economic justice, racial justice, indigenous, and environmental organizations immediately announced their support. While setting lofty goals, the plan does not explicitly call for eliminating the use of fossil fuels such as oil and natural gas, a nod to pragmatism that may disappoint some of Ocasio-Cortez's strongest backers. Even so, the Green New Deal is more ambitious than the Clean Power Plan proposed by former President Barack Obama to impose emissions limits on coal-fired power plants. Trump, who has expressed doubts about climate change, scrapped Obama's plan as a job killer. While Democrats did not specify a price tag, some Republicans predict it would cost in the trillions of dollars. GOP lawmakers denounced the plan as a radical proposal that would drive the economy off a cliff and lead to a huge tax increase. "The Green New Deal is a raw deal for the American taxpayer," said Sen. John Barrasso, R-Wyo., chairman of the Senate Environment and Public Works Committee. Barrasso called the plan "a socialist manifesto that lays out a laundry list of government giveaways, including guaranteed food, housing, college and economic security even for those who refuse to work." Ocasio-Cortez said the plan's scope was its strength, saying "small, incremental policy solutions are not enough" to repel climate change, which she called an "existential threat" to the planet. Far from overreach, the plan addresses a sense of growing frustration by young people and others who "don't feel we're being ambitious enough" to address a potentially cataclysmic danger, she said. With a whiff of presidential politics and a rock-star freshman in attendance, Democrats drew an unusually large crowd for the Green New Deal unveiling. The outdoor event was attended by more journalists and activists than lawmakers. It was a notable gathering for a proposal that is not a bill, but only guidance for any legislation on climate change Congress develops. The measure is supported by at least six senators with their eyes on the White House: Cory Booker of New Jersey, Kirsten Gillibrand of New York, Kamala Harris of California, Elizabeth Warren of Massachusetts, Bernie Sanders of Vermont and Amy Klobuchar of Minnesota. None of the six attended the news conference, and House Speaker Nancy Pelosi said hours earlier she hadn't read the proposal. Pelosi did not explicitly endorse it, but welcomed "the enthusiasm" of its backers. "I welcome the Green New Deal and any other proposals" to address climate change, Pelosi said, adding that she also wants to hear from a new House committee on climate change. Pelosi said the panel will "spearhead Democrats' work" on climate issues. Ocasio-Cortez said Pelosi invited her to join the climate panel but she declined, saying she wants to focus on the Green New Deal and other committee assignments. The resolution introduced Thursday marks the first legislative language attached to the Green New Deal, a concept that until now has been loosely defined as a call for action to head off catastrophic climate change and create jobs. Answering critics who call the plan unrealistic, Ocasio-Cortez said that when President John F. Kennedy wanted to go to the moon by the end of the 1960s, "people said it was impossible." She compared the plan to Franklin D. Roosevelt's New Deal and Lyndon B. Johnson's Great Society. Asked how the plan would be paid for, Ocasio-Cortez said it would be "the same way we paid for the original New Deal, World War II, the bank bailouts, tax cuts for the rich and decades of war — with public money appropriated by Congress." She called the plan an "investment" that would produce more than it costs in new infrastructure, jobs and avoided health care costs. A new global study says deadly heat waves will grow in frequency, intensity and duration, affecting 75 percent of the world’s population if greenhouse emissions are not reduced.